First Doug Carswell and now Mark Reckless have left the Conservative party to join UKIP. 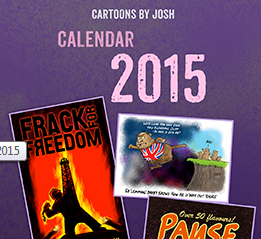 Is the message getting through yet Mr Cameron? Today, I am leaving the Conservative Party and joining UKIP. These decisions are never easy. Mine certainly hasn’t been. Many have been the sleepless nights when I have talked it over with my wife and thought about the future of our children. But my decision is born of optimism, conviction Britain can be better, knowledge of how the Westminster parties hold us back, and belief in the fresh start UKIP offers. We all know the problem with British politics. People feel disconnected from Westminster. In fact, “disconnected” is too mild a word. People feel ignored, taken-for-granted, over-taxed, over-regulated, ripped off and lied-to. And they have reason to. MPs, with some honourable exceptions act, not as local representatives, but as agents of the political class. Too many focus, not on championing their constituents’ interests at Westminster, but on championing their parties’ interests in their constituencies. 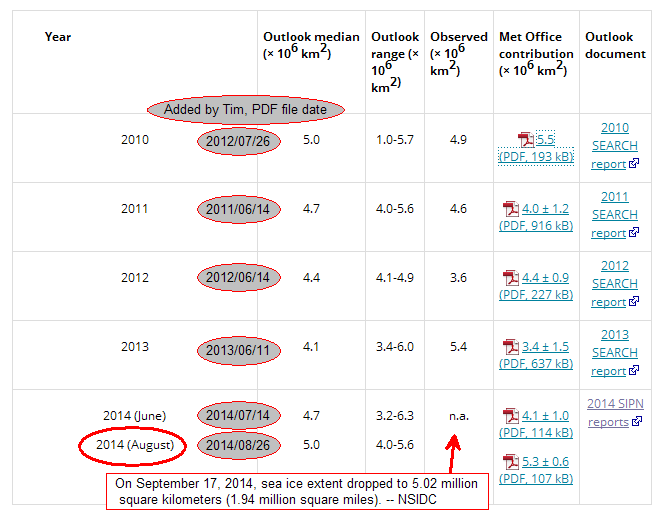 Met Office Arctic sea ice extent, issue a forecast 2 months nearer the date? The UK Met Office forecast for things they choose, such as Arctic sea ice extent but seem completely silent on Antarctica or even handedly dealing with both of pairs of extremes. It is possible the file dates do not reflect change in the documents. Someone the current US President might do well to listen to before voicing opinions on climate matters is profiled here. “I do not pay obeisance to the consensus and I think for myself, and they don’t like that,” said Curry, a professor at the School of Earth and Atmospheric Sciences at the Georgia Institute of Technology. The size of the sun is of critical importance to solar studies yet this is poorly known, let alone if and how the size varies over time. Paper published this week in Astronomy & Astrophysics. Paper access is available with registration. Deafening silence in most of the mass media about this. Why is that? 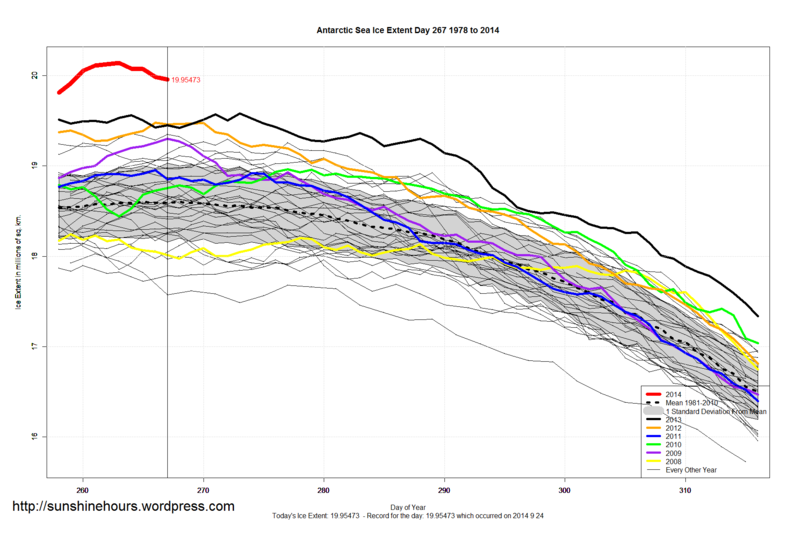 Antarctic Sea Ice Extent Sep 25 2014 – 1,362,000 sq km above the 1981-2010 mean. Data for Day 267. Data here. 13th Day Above the 2013 Record. 184th Daily Record. 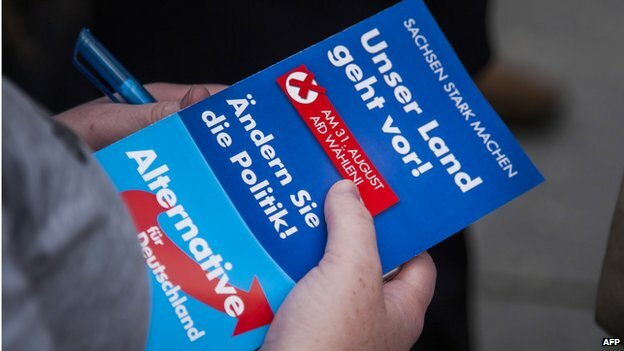 Recent voting successes for the ‘Alternative for Germany’ party, which in some respects is similar to UKIP, have ‘upset the chemistry of German politics’ according to a Daily Telegraph report. Oh dear, how awful (!). Report: ‘Attempts to discredit the party as a Right-wing fringe group have failed.’ A familiar tactic with the same result as in the UK. Although they don’t advocate leaving the EU altogether, they are opposed to Germany being a member of the ‘eurozone’ currency union. This is based on the data provided from the “Solar Cycle Progression” web page, “Provided by the NOAA/Space Weather Prediction Center” except substantial data post processing has been done. The datasets have been heavily normalised but the F10.7 earth distance problem (or something of a similar origin) has been partially compensated before normalisation. Normalising brought the three datasets closer to the same. 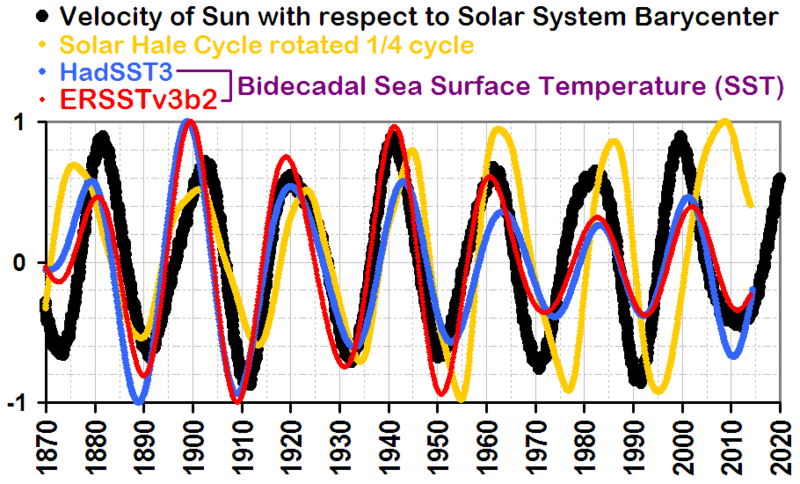 Paul Vaughan has suggested we hold a discussion on bi-decadal climatic variation, which exhibits quasi-cyclic patterns in various datasets. To get the ball rolling, Paul has kindly given some time to producing some very interesting plots which he has introduced across a few recent threads. This posts puts these in one place and acts as an invitation to those interested in a focussed discussion on the topic. 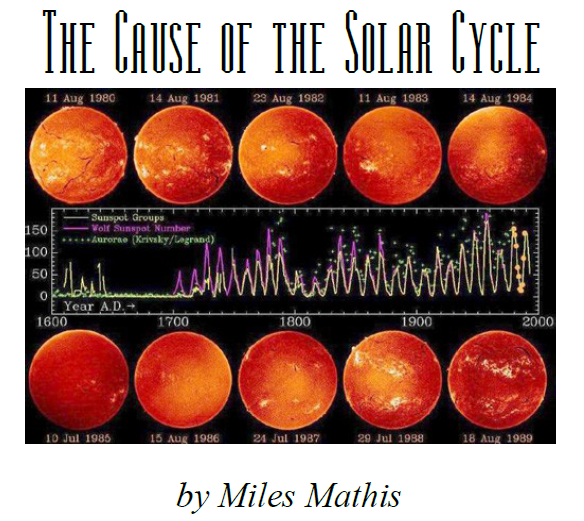 Is it caused by the solar Hale Cycle as suggested by Tim Channon or is it caused by the velocity of the sun with respect to the solar system barycenter as suggested by Nicola Scafetta? The UK Met Office / Hadley Centre (Met Office) / Climatic Research Unit (UEA) construct and publish global time series for temperature based on published 5 degree gridded. How this is derived from land meteorological station readings and ship board for sea surface temperature is unclear. The gridded to eg. global is a simple (cosine) weighted average which takes into account the variable area of a linear grid representing a sphere. Do I detect obfuscation, flapping for distraction? The Talkshop has an interest in orbital periods, spin-orbit coupling, the equalisation by nature of the gaps between objects. This article has merit in interest but is a precursor to a following article containing the results from a large new work about Met Office gridded data CRUTEM3, HadSST3 and HadCRUT3. Links to the event of 1956 as a validation mark. In looking for evidence of a major cold snap in France the following personal account article appeared, it has sunspots SSW and lots of falling snow. That year ended with a terribly cold wave in the Southern Hemisphere, with snow mixed with rain at Geraldton in Western Australia, at a latitude 28.48 ° South, which was the snowfall at lowest latitude ever recorded in the Southern Hemisphere. Usually, cold waves affecting Europe and North America are a consequence of stratwarming, which is an unusual heating of the stratosphere above the North Pole, which in turn leads to tropospheric arctic anticyclones, with consequent descent of cold air to lower latitudes. But not so in 1955-1956, the longest and geographically widest cold wave in the 20th century. A thoughtful article recounting reasons for personal choice by someone who has considered both yes and no in the Scotland indyref. The parallels with the climate debate are striking. 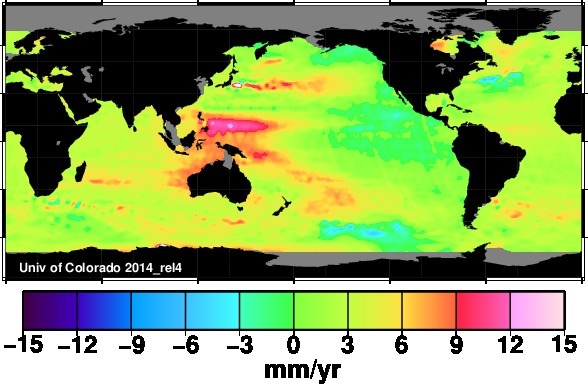 According the University of Colorado, sea level is rising much faster than 85% of tide gauges show, and forming a massive mound near the Philippines. Apparently they believe that water likes to pile up in mounds, and to help visualize their BS I created a 3D animation. This complete garbage forms the basis of the IPCC claim that sea level rise suddenly doubled in 1992, when they switched measurement systems. Tony Thomas mentions he has an opinion piece up on Quadrant about the reality of electricity and human wealth in all the ways not so obvious, but also right on the past cries of environmentalists deeming the undeveloped world must not get wealth. 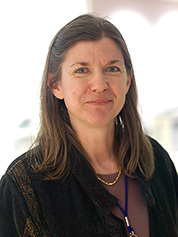 “I’m a resolute agnostic about the climate issue. Tell me CO2 is good, tell me it’s bad. I’m bored with the nastiness. 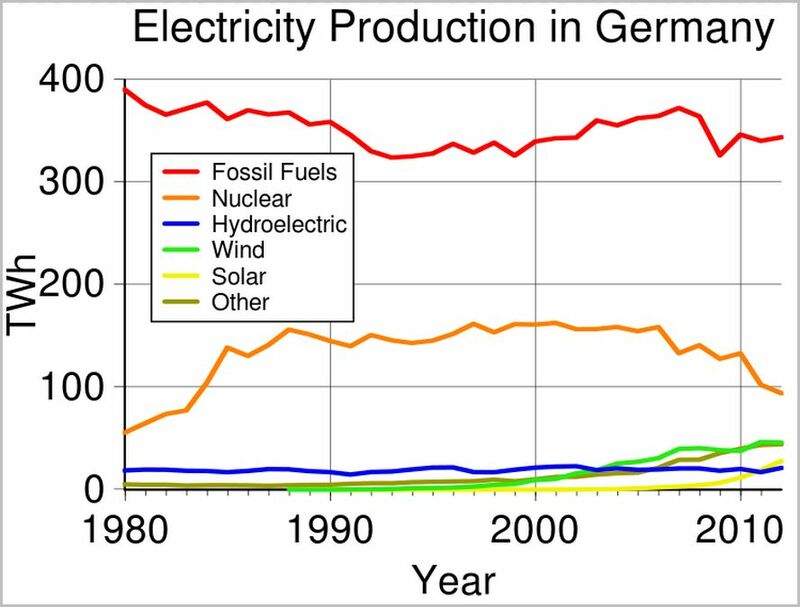 Given a winter of disconnect is mooted by some, any introduction of a real power station is news but not just yet. 3 The Order, if made, would grant development consent for the construction and operation of a thermal generating station that would operate either as a Combined Cycle Gas Turbine (CCGT) plant or as an Integrated Gasification Combined Cycle (IGCC) plant, with a total electrical output of up to 470MWe at North Killingholme, Lincolnshire. The generating station would only be able to burn other types of fuel such as coal and biomass if the full Carbon Capture Storage chain is in place. A separate Environmental Permit, controlling emissions from the plant, will also be required from the Environment Agency before the generating station can be operated. Combined Cycle Gas Turbine is one of those over-egged technologies with party trick claims. As sustained base load the thermal efficiency is good but part load is dreadful, becomes a gas turbine, one of the less bright inventions which has a redeeming feature of great power in a small space. A lot to do with heat engines is counter intuitive. A weakness is always a sharp drop in thermal efficiency with power reduction, how rapidity it drops varies greatly with the technology. And IGCC? That is where things get bad. Hockey Schtick: CO2 does what exactly? have to thank them in this case. Without their numbers I could do nothing. been presented, the cause of all three numbers is unknown. I will show you the correct answer here. case we will see that Jupiter is the cause of the primary variance. In a recent post we broke the news that a heroic band of scientists was finally making Australia look good. A number of readers questioned whether it actually takes courage to have the courage to admit you’re scared of climate change. Speaking of historical dramas, my thirteen-year-old thinks he’s getting the 300 box set for his birthday tomorrow. But I reckon he’ll be even more popular with his mates when he opens his actual present: a donation to the Scared Scientists in his name!